Hey folks I'm new to this site. I've done a lot of off road camping and hunting, and just did a 10,000 KM solo Adventure bike trip through the Arctic. I just picked up this 2001 F550 With a 12' cab over van body already. I have lots of ideas already but the first is what to use to insulate the inside? 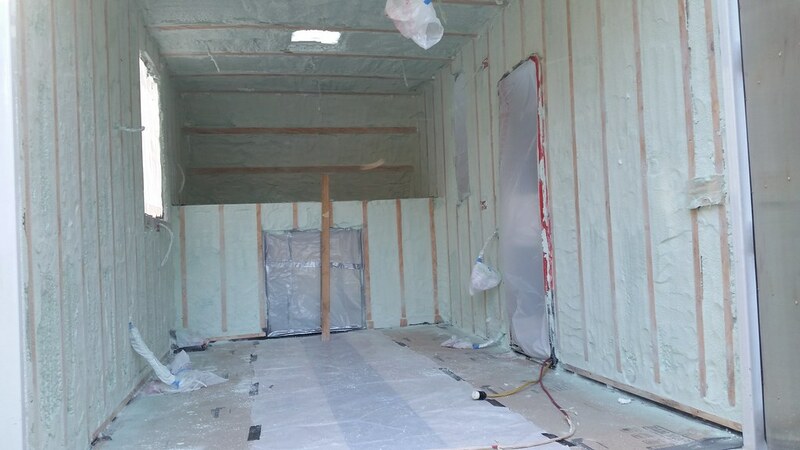 It already has some insulation between the aluminum and the plywood on the inside that is similar to insulation in a truck cab. It's about 3/8" thick. We do lots of winter camping up to -20 so that won't be enough. Any suggestions would be appreciated. Here is my start point. can you take a close up shot of the wall & insulation assembly, I wonder if it was original or done later. overall, the UHaul boxes are a great starting point, as they're made like an erector set, everything is modifiable. I won't be picking it up until next week, but I'll take a close up picture then. Very nice!! I just did an F450 box truck, used polyiso spray foam, very happy with it. Have only been down to just under freezing so far, but we do lots of winter camping too. Its toasty. I added ply strips for furring and filled between them. There is going to be some cold bridging, but it was a trade off. You may be able to use something other than ply that will transfer less cold. Anxious to see what you come up with, subscribed. Awesome! I've been planning on doing something similar for a few years now too and I just bought a box van last weekend. I plan to do something very similar to Java's awesome rig. Did you screw the ply to ribs first? I was thinking of strips of 1x4 or 2x2 then spray foam. It's cold here so I thought 1 1/2" insulation at least. Just working on an electrical issue with the starter. I got an RV door and scored 3 brand new tinted RV windows from the bargain cave at a local giant RV shop for $5.00 each!! I'm going to mock up the inside layout to figure out what I want inside. Java what did you use for interior paneling? Like Java did we are going to line the box with ply strips and spray in insulation. My daughter and I started gutting it today. She's a cabinet maker by trade, so guess who's building the cupboards and counters! It's corrugated under the ply that was on the inside so I'll get a nice 1.5" insulation easy. I'm also going to spray foam the corrugations under the cab over then cover it with aluminum checker plate. When I get the spray done I'm also going to spray the underside of the entire floor. This will add some head space inside. I have a friend who works at a Garage and he'll undercoat the box once it"s all done. I got an RV door for it and installed a brand new latch in it. Didn't come with a key, and this one is black and matches the new windows and has an external locking dead bolt. Yes glued and screwed the ply strips. My walls have 1.75" of foam in them. Skinned the inside with 1/4" Birch ply. Heavy, but cheap and easy. It's micro pinned and glued onto the strips. If I were doing it again I would run some electric heat Matts under the flooring also, wish I had on mine. We camp a ski areas a lot and many of them make you pay for hook ups, even if you don't use them. Might as well have toasty floors on someone else's electric bill. I may put an extra 2X4 under the frame rails to lift the box up some more for when I spray foam. May sheet in the foam under the floor with Aluminum or just the under coat, not sure yet. Got it all gutted out yesterday. Very little work to do on the box, its in great shape. Java what did you do with your back doors? I'm going to glue/seal and screw mine permanently closed. I'm going to leave the hinge mounts for the top two on the box sides and build a rack for the spare tire etc. I am going to have a 4' X 6' removable metal ramp off the back to haul my 4 wheeler or my dual sport motorcycle on. This box has a nice heavy bumper setup that's tied to the frame, real good base to fabricate from. Looking good! I left my back doors, one side is storage from the exterior, skis, EZ up etc. The other opens to my bed, access to underneath or extra ventilation if needed. I will add a second seal at some point, they are pretty well sealed except a couple little spots. My doors don't seal so well right now so permanently closing them seems best. I originally wanted it to be a toy hauler but there isn't too much room, and a previous attempt with a holiday trailer had incredible dust issues. This thing has so much weight capacity having a 500 pound four wheeler hanging off the back won't be an issue. With the spray foam inside I'll have a 100% seal on the back! Java did you put a ply Furr on every rib, or go like 16" centers or whatever the closest rib width worked out to. My thought is that if I did 16 centers I would foam right over those middle ribs and I'd have 3\4" of insulation and might stop the cold coming through. Would also be a lot less grinding. I'm leaning towards the DIY 600 sq foot foam kits. I did every rib. I think you could skip every other if your willing to take the time to get the foam perfectly flat. Without that to support the ply/inner skin I think it will be too floppy. I have not been down to super low temps yet, only 28 ish low, and the windows were the biggest loss/conductor, and the cheap *** RV door. I have used them for construction projects in the past. They work ok, if you do a few tricks. Get an old cooler that the tanks will fit in, fill it with HOT water and dump them in there. You want them at about 80 degrees to work worth a poop. Get extra tips (most kits come with a couple) the will clog each time you stop spraying. You will not get the claimed board feet out of them. I would have needed two for my truck by my calculations, at that rate it was only a couple hundred bucks more to have the pros come and do it and do all the grinding too. If you use the closed cell stuff (which you should!) it needed to be ground with a wire cup on a 4" grinder, its too hard for the knives or scarifer style cutters. That was nasty work.